"We are hard pressed on every side, but not crushed; perplexed, but not in despair; persecuted, but not abandoned; struck down, but not destroyed. We always carry around in our body the death of Jesus, so that the life of Jesus may also be revealed in our body." It is impossible to always have agreement with people within an organization or an enterprise. It is the case no matter how well they get along and they maintain a good team spirit, even within a church that is supposed to consist of people of the same spirit. This is more so within a business that is composed of people of different motives and goals. A missional business is not an exception. Without conscious attention and intentional efforts, a missional business can face significant challenges in the midst of disagreements. 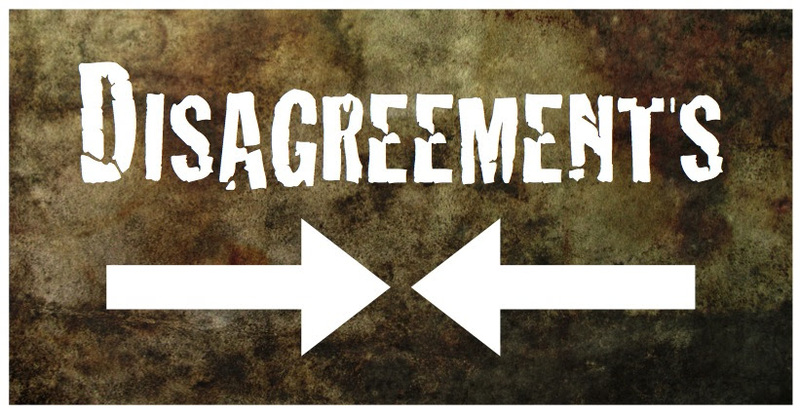 The following article suggests some pragmatic tips in handling disagreement among brothers and sisters in Christ. On November 14-16, a 3-day strategic meeting (Nov 14-16) with a missional entrepreneur in Cambodia and his team members took place in Chiang Mai, Thailand. We have agreed on establishing an alliance effective 2018. This strategic alliance will help strengthen SfK Ministries significantly. Praise the Lord who provides! God has also provided an implementing member in Tanzania, Africa. Although there are a few details that need to be ironed out, we are excited about possibilities and are confident in Christ's wondrous provision. On November 26th, Jeffrey had a meeting with a large Korean American church in southern California to explore the possibility of collaboration in 2018. The meeting went smoothly and we are waiting to take the next steps. We are excited about what the Lord will do through this relationship. Jeffrey delivered a message about the Ministry of Reconciliation in conjunction with work, business and Business as Mission at New Jersey Harvest Church in Closter, NJ on Dec 1, 2017. There were a couple of fruitful meetings in Pennsylvania to explore the possibility of strategic alliance. Nothing concrete came out of the meetings, but the efforts to seek collaboration will continue through alliance or partnership. SfK Kingdom Fellows and potential supporters got together with Jeffrey in California and New York. Jeffrey plans to continue meeting with groups and individuals through December 22nd. During his trip to the U.S., Jeffrey has shared with people several products made by a few freedom businesses in Kolkata, India, Kathmandu, Nepal and Bangkok, Thailand. He has also shared a couple of products sold by a Cambodian missional business. We seek to establish a network of trading posts in different cities to promote these products, which expect to produce synergy for the Kingdom of God through holistic transformation. And, the Lord has prepared a veteran businessman to lead our endeavor for this trading line of business for SfK Ministries. Praise the Lord! Jeffrey will travel to Atlanta, Georgia, Denver, Colorado and Los Angeles, California to meet with several potential supporters. Products made by freedom and missional businesses will be shared, as well as messages to challenge and inspire people to become involved. Please pray that these meetings will produce many fruits that will honor God. Jeffrey has agreed to serve as a member of the Board of Directors of Freedom Business Alliance, a global trade association for freedom businesses. Please pray that he will serve with integrity, excellence and stewardship. SfK Ministries has begun to update its Strategic Plan (2018-2020) and its Vision 2020. Please pray that this process will be realistically ambitious in God's eyes. All members of SfK Ministries have begun to establish their 2018 business plans and budgets. Please pray that this process will go smoothly and bear godly fruit. Feb. 9, 2018: SfK Life (USA) will hold its board meeting. Mar. 20, 2018: SfK Korea will hold its board meeting. Please pray that these meetings will be conducted in a godly manner and will produce beneficial decisions and execution plans. SfK Missional Business Academy (MBA) schedules are filling up quickly for 2018. So far, SfK MBA has been scheduled tentatively for April in Korat, Thailand, May in California, July in Kigali, Rwanda, October in Chiang Mai. Please pray that the preparation will be made thoroughly and SfK MBAs will produce significant impacts in the lives of people in the corresponding countries. SfK Ministries seeks partners and supporters. As the Lord expands the ministries of SfK, we trust that He will also send partners and supporters as needed. Please pray that the Lord will help us open our eyes to see His will and ears to hear His voice clearly..
May the Lord will help you finish 2017 well and prepare you for a renewed start in 2018. God bless you richly to be a blessing to others. Wishing you great joy in celebrating the Advent of our Lord Jesus Christ! Copyright © 2017 Synergy For the Kingdom Ministry, All rights reserved.